Thursday evening, before we left for Atlanta for Christmas, our tile arrived at Nitro Carpet, yeah! This is actually big news because the store closed this past Friday for 2 weeks. If it hadn’t arrived, we would’ve had to wait 2 weeks to pick up. 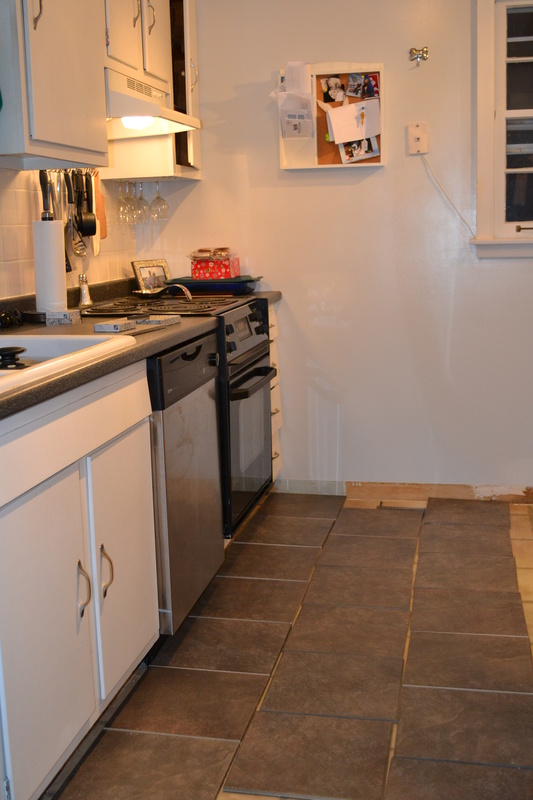 After laying out a bunch of pieces on the kitchen floor, it actually has more of a brown hue than we expected. 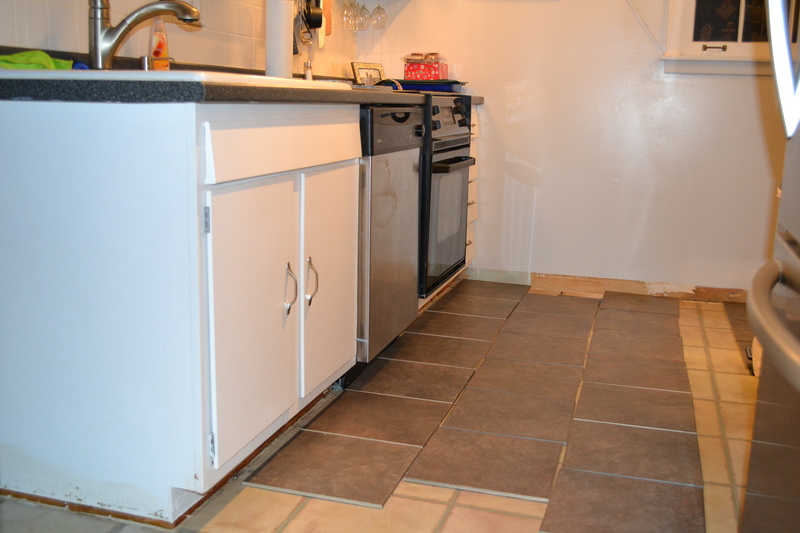 After all, we ordered 100 square feet of tile off one 13×13 tile. It’s a little disheartening since we thought we ordered a black tile with grey hues, but it’s non-returnable, so we’ll work with it! 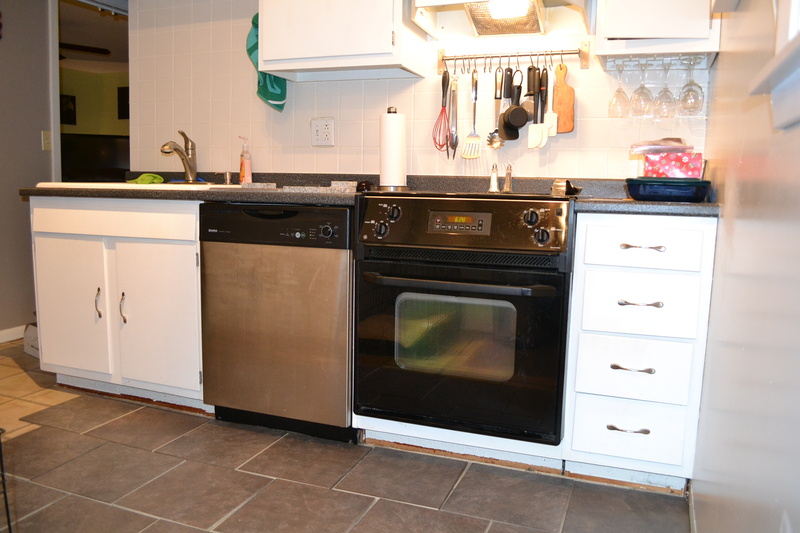 We played around for awhile with the tiles and finally came up with a diagonal brick pattern. The straight brick pattern was just a bit too parochial for us. Definitely sold on the diagonal brick pattern, just not sure which direction we want it to go. Our goal is to make the room appear longer/wider. I’m sure we will play around several more times before we decide on a set pattern. 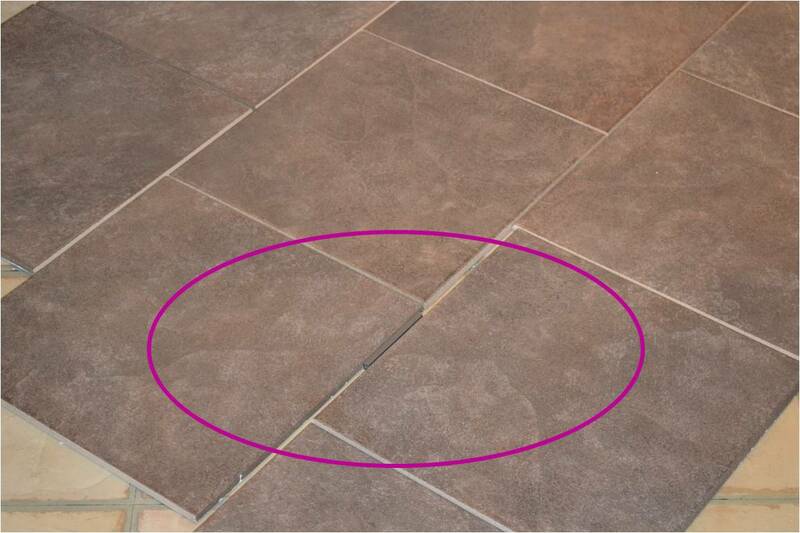 We also inserted a piece of the sample grout to see what it would look like when filled. Keep in mind these photos are not nearly accurate to the actual colors. 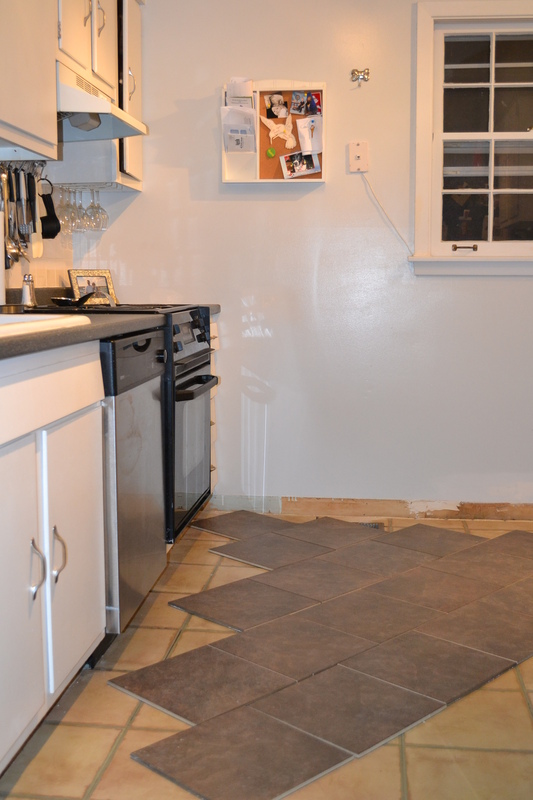 We plan to keep the smallest possible grout lines since A) grout is expensive (if you use the color lock brand like we do) and B) grout is just plain ugly in my opinion. The plan for the week is to get the 3 layers of laminate flooring up…yikes! Good thing we have a 4 day weekend to get this baby accomplished! 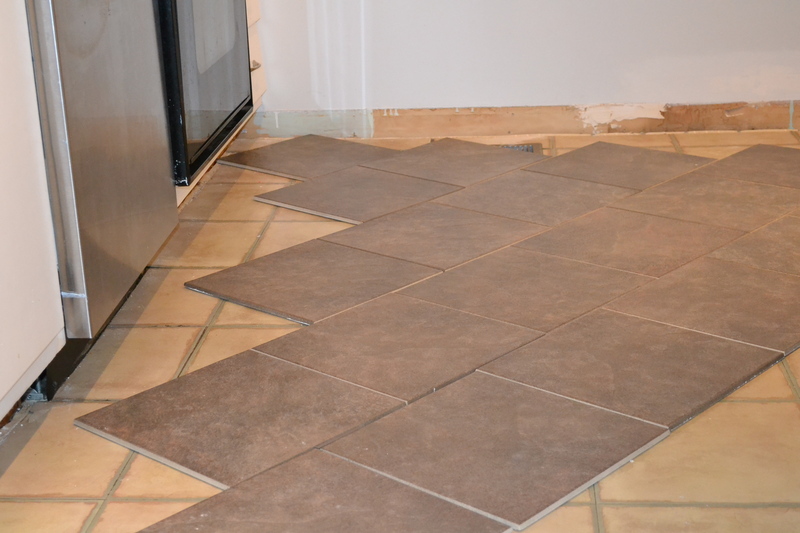 Also in the 4 day ‘dream-plan’ is laying the hardiebacker (mentioned here) and putting down the new tiles. 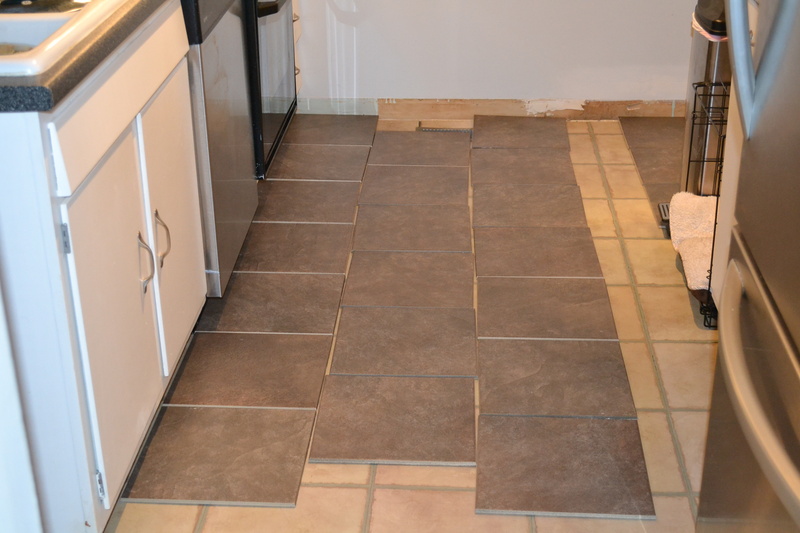 The tile will have to set for at least 24-48 hours before we can apply grout. I’d like to be hopeful thinking we might be able to do it all over the long weekend, but having done this project several times, I know we will not. Keep your fingers crossed for us, we have a long week of sweat equity ahead! !